I quickly learned that there's infinite opportunity to upgrade these vans in every conceivable way, but unfortunately our budget is very much finite. We'll be keeping upgrades and add-ons to what I consider essential (for safety and utility). After completing some front-end, steering, and alignment work on the van, it was time to toss the dry-rotted, unevenly worn Continentals. While some Vanagon enthusiasts suggest upgrading the wheels to 15" or 16", I decided to stick with the stock 14" alloys and replace the tires only. I had no baseline for comparison, and I knew that anything would be an improvement from what I'd been driving on. And $400 versus $1200 investment was also a major factor. 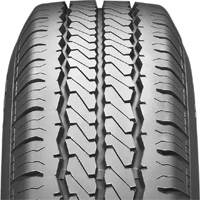 The Hankook RA08 185R14 All Season Radial handles well and has excellent wear characteristics. This tire has a ten year track record, and is the only all-season tire in its price range to be made by an O.E.M. supplier to VW. Although the RA08 is about 40% cheaper than the Michelin Agilis, in a recent track test comparison in the German magazine ProMobil-Extra it outperformed the Michelin in every single handling test they performed (wet and dry handling, wet and dry braking, and aquaplaning). It is an excellent value and we recommend it highly. They are definitely a huge upgrade over the aged Contis, but we have yet to put any serious road trip miles on them. They are much quieter, and it's nice to know that I'm not riding on half-bald asymmetrical time bombs. Hi Jeff - keep the posts comin' Last fall I bought the exact same model van as you, at least I think so from the pictures. And I live right outside Boston. Any update about those tires ?